We are deep into summer now and this week it seems like everyone is going on vacation. Not only that but so many of the romance writers I know are taking off to San Antonio for the annual Romance Writers of America Conference. The RWA conference was the first writing conference I ever attended. Actually it was one of the first RWA national conferences ever, more than 30 years ago. It was where I actually started learning about writing for someone other than myself and my family and friends. The conference has grown considerably since those first days aboard the Queen Mary in Long Beach, California. Instead of hundreds of attendees, these days there are thousands. It’s still a great event and I’ll miss seeing old friends and getting the latest scoop on romance writing. While I’d have loved to go this year, I’ve also discovered the joys of conferences that are almost as small as that first one I attended. If you’re regretting missing the RWA national, or suffering from the summertime blues if you aren't going on vacation, don’t let it get you down. Look around for local or nearby opportunities to get support for your writing or to learn more about the craft without having to spend as much money. 1. Check out local, smaller conferences. Watch for local or regional writing groups that hold weekend conferences. I’m lucky enough to live in Colorado where we have a thriving group of writers. Rocky Mountain Fiction Writers hold an annual conference that always brings in some big national names as well as presenting programs that feature local big name authors. But there are many romance groups that do the same in the Midwest, the Northwest, the East and Southeast. I’ve attended some of them and always come away filled with new information and pleased with the ability to attend sessions on craft or writing techniques. 2. Check for one day writing sessions offered by local groups or libraries. Our Denver area romance writing groups both hold one day “mini” conferences where they concentrate on one or two writing issues, but they also bring in agents and editors for pitch sessions. They are easy to afford and a good way to refresh the writing spirit. 3. Go outside your genre and look at different writing groups and see what they offer. For instance, Mystery Writers of America present one day sessions all around the country that are well worth the money and the time. 4. Watch for smaller fan conferences. Left Coast Crime has become one of my favorite smaller conferences because it gives writers and readers a chance to connect. The panel sessions are filled with authors who not only talk about their latest books but also what is happening in the publishing world. For the past few years I’ve also attended RomCon, a romance fan convention that is always lots of fun. This year it included “university” sessions on the writing craft. I had the opportunity to present my session on creating characters. 5. Make your own mini conference with online classes. If you aren’t a fan of big groups, don’t forget there is a whole online world out there that can help you learn about writing and can also introduce you to fellow writers. I’ve made many friends who were fellow classmates online and now I am meeting many fledgling writers as I teach classes for Savvy authors and other writing groups. 6. But if you’re still feeling like you’re missing out because you won’t be in San Antonio with all those other romance writers this week, try what our local RWA group is doing. Have a group over to brainstorm. At least it can give you the opportunity to hang out with other writers. And it might get you inspired to get back to work. So don't let those summertime blues get you down. While you might not be able to get away this week, you can always find something else coming up that you can plan for. And it might just open up some new opportunities as well. 1. One of my habits that I have always had is carrying a small notebook with me at all times. Actually I have a small one in my purse and another in my car that are always handy if I stop someplace for lunch and want to write. On more than one occasion I’ve written a scene or two or a blog while I’m waiting for someone or between courses. 2. Writing sprints are good, short ways to work. 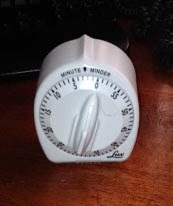 I have a kitchen alarm that I can set for a few minutes or up to an hour and then just work until it rings. Sometimes I just reset it if I find myself in the middle of a good scene or I just turn it off and keep on going. 3. Keeping track daily of my word count helps me not only strive for more but also shows me how much I am getting done every day and every month of the year. I have been doing this for several years now so I know that I will be most productive when I do the annual NaNoWriMo and turn out 50,000 words. But that word count has also prompted me to try for that amount during other months of the year. 4. Doing NaNo or other such group activities like Book in A Week where you have to turn in a word count can also get up your work count and productivity. They can provide a reason to be accountable. I have several writing groups that do BIAW from time to time and I always try to take part because it means I will work really extra hard for those weeks and that usually translates to increased word counts for several more weeks. 5. Critique groups can also help. I’ve heard quite a few people say they like being in a critique group because it means they will have to produce pages for the next week. Sometimes the writing might not be the best work, but those writers also say the pages can provide a good starting point and because they are taking them to their critique group, they’ll get help on improving them. Those are just a few ways to get going. But there is always that weekend retreat you can try. I still sometimes do it, but if I can't afford to get away, I’ve also done my own writing retreat at home. I ignore the TV, turn off the phone ringer, and unplug the internet so I’m not tempted to check email or Facebook. Then I sit at my computer and work. The only distraction I might allow myself is another way to get inspiration and that is music. I put on something that either fits what I’m working on or perhaps something soothing. When I’m writing a love scene I like romantic tunes or when I’m writing break ups, I’ve often used very sad songs. Any of these ideas can work at any time. Sometimes the simplest solution works the best. Just sit down and work. Any other ideas for getting up that word count? My Writing Corner is opening up the doors to the outside world this week -- with a look at finding the right location for setting a story, researching the location and some of the pitfalls of writing a good setting for your story. A year ago today I was visiting Santa Fe, New Mexico, partly as a reunion with friends, partly to visit with family, partly to see a student writer and partly to conduct research. 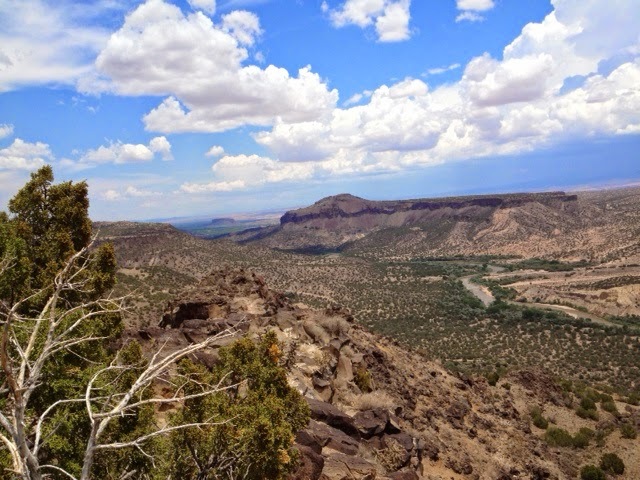 When I set my DEAD MAN romantic suspense series in New Mexico, I knew it would require spending more time there. Setting to me is one of those critical things in a book that should be felt rather than forced. Every place I visit I consider research because I never know when I might use the location in a book. When I visit places I’ve never been and get an idea for a story, I always make a point of stopping to think about what characters might be seeing or feeling or thinking. In past blogs I’ve talked about the importance of using all one’s senses as a writer and that is critical in helping to make a scene come alive. It's a good practice to get into, wherever you visit. You never know when you might want to use that place as a setting for a story. Think about it while you’re there so that you can summon your memories as you sit down later to write. Use all your senses. What are you smelling? What do you see? How does the air feel on your skin? What are the colors around you? What do you feel about the location? What are you hearing? Lots of traffic? Quiet? Different languages? Is the air hot, sultry? Cool, dense? Is the day gray or so sunny the water around you sparkles? As I write my books, the setting or location is often every bit as important as coming up with just the right characters and just the right plot. Many times my setting has dictated what I want to write. My book DEADLY MESSAGES opened in Vancouver, BC, in Stanley Park because the idea for my book came to me while I was walking around the park with my sister. Being much slower, I fell behind her and as I ambled along I started wondering what would happen if we didn’t link up at our appointed meeting place. In some places it seems you can disappear into the dark depths between the trees and bushes even while you can hear the sounds of Lions Gate Bridge not far away. People might be running or walking only yards away along the seawall but you can still feel totally alone. And totally vulnerable. My novella, SHADOWS FROM THE PAST, was also set in the gloomy mists of the Northwest and it is set in an old mansion. What is more fun than a big old spooky house when writing a gothic romance? They go together naturally. 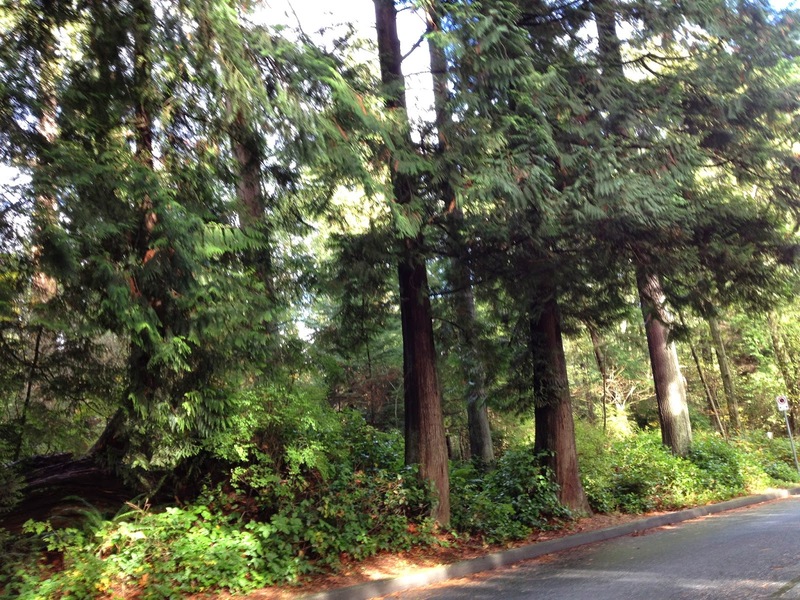 A visit to the San Juan Islands provided me with the idea for that story. The quaint villages where everyone knew everyone with their picturesque older homes scattered among cottages and new vacation homes were great fodder for my imagination. I wanted Redfern Manor to be like every strange old forlorn house that ever intrigued me--an old graystone with plenty of secrets and plenty of peculiar characters. 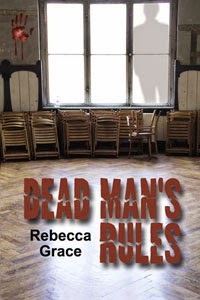 In my newest book, DEAD MAN’S RULES, I wanted to bring a small New Mexico town and its people to life. That was part of what I was doing last year, visiting several small towns to get their feel. I knew some of the dynamics of small town living, having spent my earlier life in a small town much like Rio Rojo, where everyone knew everyone and their families and many times their family history because everyone went to school together and their parents went to school together. But there is also a special feel to the flow of life there that is quite different from the life that one might have in a city. Capturing some of that was important to bringing the small town to life. So was the feel for the location. 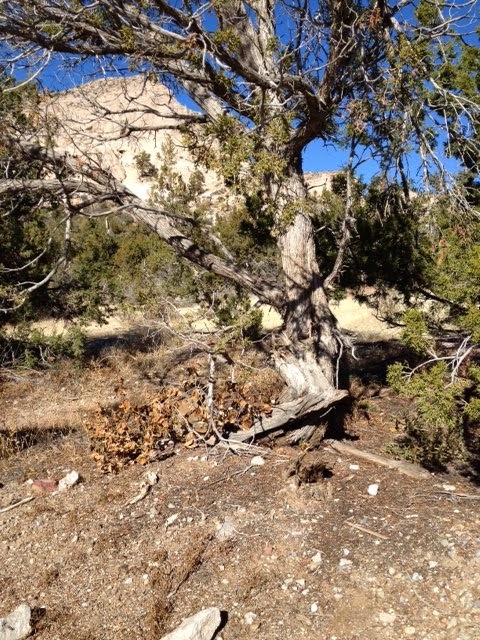 Besides spending time in several towns, I also travelled out into the country side outside of Santa Fe. A visit to Tent Rocks was a good way to sample the location with its awesome rock formations, and the difficulty of navigating the dry, sandy terrain. Likewise a quick trip up to the top of the Santa Fe Ski Area showed me how quickly that dry terrain could turn mountainous and treacherous in the winter. 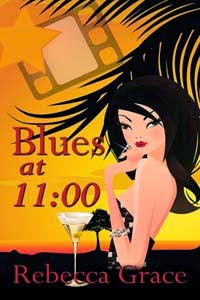 My next mystery, BLUES AT 11, which will be coming soon from The Wild Rose Press, is set in Los Angeles. While I lived there for nearly 20 years, I also have been gone for 12 years and things have certainly changed quite a bit since I make the city my home. I have had to make several trips back and spend some time just wandering and getting to know the city again to make certain my story still has an authentic feel. Some things haven’t changed, I’ve discovered – the feel of being at the beach at sunrise or the special sensations of electricity in the air of things happening. The traffic remains and is worse, but the new train system now links more parts of the city, and parts of old Hollywood have been transformed. These are the types of research elements that are necessary to check out again, but not every place changes as quickly or as drastically. For readers who enjoy a good horror or fantasy tale, they said they wanted to see the world where the story is located, but they don’t want to be overwhelmed right at the beginning with so much detail they don’t get involved in what is happening in the story. They want to be drawn in with the plot even if the story is happening in another world. One noted a great battle scene where the author spent a small amount of time to describe the valley where the armies were lined up against each other. When the battle started, he had a good feel for the location of the river and nearby cliffs that provided a backdrop when the armies clashed. The same goes for mystery, westerns or romance. Many of those readers mentioned the work of Stephen King and how he can make some of the most common towns and locations scary with just a few words. The fact that a supernatural event or monster might come to an ordinary town, such as Chester’s Mill, his imaginary location in the bestselling novel, UNDER THE DOME, now a hit TV series, makes the location even spookier. Whether you're visiting a place to get that certain “feel” of a place, or making up the setting and developing it from your own imagination, never forget the reader. Put them in your location so they can feel it too. It helps them relate to the characters and to the story. 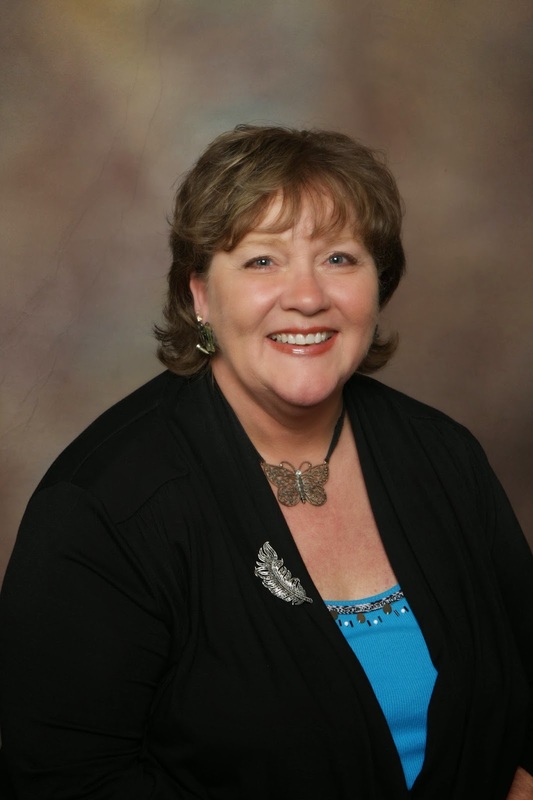 My guest in My Writing Corner today is author Sandra Dailey. Tell me a little of your writing journey. On your website you say you started telling stories at a very young age. How did you get started on the road to publication? My mother believed in a quiet house, even though she had seven children. Story telling was a way to keep the little ones entertained. We older kids would also play ‘I had a dream last night’ and try to come up with a more outrageous story than the last one. Later, my husband and I had four children, close in age. It was natural to pick up the story telling again. It wasn’t until the house was empty of children that I started writing my stories. My family encouraged me to seek publication. I still think of myself more as a story teller than a writer. Did you know you were meant to be a writer when you were making up those stories? I never considered being a writer until my mother talked me into taking a writing course with Long Ridge Writers Group. It was mostly about writing articles and short magazine stories, but I learned a lot about characterization, disruption, plotting, submission, etc… I was the ripe old age of 55 when my first real book was published. Who are some of your favorite authors in the romance genre? Nora Roberts, Linda Lael Miller, Lori Foster, Brenda Novak, and Laura Kaye. I’m very diverse in my reading though. It’s not all romance. My favorite authors of all time are Heather Graham, Iris Johansen and James Patterson. Tell us a little about your newest work, Common Enemy. What gave you the idea for this story? Driving through a rain storm one day made me think about the years I’d lived in the Everglades. That led me to remember some of the unusual crimes that happened in the area that no one talks about. I decided to combine a few in a story. Love turns Connors despair into determination and his hopelessness into hope. He’s willing to strip away his insecurities to protect the people close to him. Jordan may seem weak and dependant in some ways, but she’s been through hell and she’s determined not to go back. She’s a lamb that turns into a lioness when her loved ones are in danger. My priority is Close Enemy. 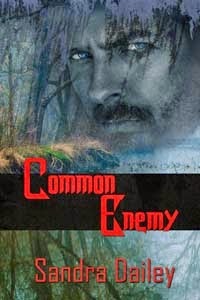 The sequel to Common Enemy is about Connor’s brother, Caleb McCrae. It’s a much different story, in a much different setting, but equally exciting. I’m also working on two mysteries, Deep Blue and Independence Day, (tentative titles). Everywhere! I’m like a sponge. A subplot in a book or movie, song lyrics, overheard conversations, or the back of a soup can. They come from everywhere and all the time. I keep an index card box full. There’s no way for me to write them all. You should network with other writers in your genre. Seek them out. Ask questions. Share favors, (promoting and reviewing each other’s books). It’s the greatest support system you’ll find. Thank you, Sandra and good luck with Common Enemy. Any questions or comments for Sandra?